There is no doubt about it – pigeons are cute and really fun to feed. However, as soon as these nice-looking birds are on the roof of your house or near your property they can be pretty troublesome and can cause damage to your house and car with their droppings and nests. 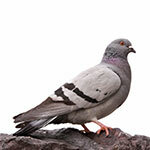 Pest-Pro Specialists can come periodically to monitor your home and help prevent an infestation of PIGEONS.